Pretty Little Liars returned for its fifth season last night in the US providing a few answers and posing a whole load more questions. If you haven’t seen the episode and don’t want any spoilers we suggest you stop reading now. If you have seen it and want to relive the action then keep reading. The fourth season finale of Pretty Little Liars saw Ezra (Ian Harding) begin his road to redemption after taking a bullet to save Aria (Lucy Hale), Spencer (Troian Bellisario), Emily (Shay Mitchell), Hanna (Ashley Benson) and Ali (Sasha Pieterse) from A. The season ended with Ezra lifeless on the floor as A escaped and it set up the return of Ali into the fold for the new season. EscApe From New York picked up where season four left off with Ezra rushed into hospital as doctors tried to save his life. As the ambulance pulled away Ali saw A on top of the ambulance and it looked like the stalking menace wasn’t ready to let Ezra reveal his/her identity. As the girls plotted their next moves, Hanna called the police and told them to station a guard in the hospital to keep Ezra safe. The girls decided to split up with Aria and Ali heading to the hospital together and Spencer, Emily and Hanna grouping together to acts as decoys for A. As they parted Hanna handed Aria a gun. Back in Rosewood news started to filter through that Ali was alive which didn’t please everyone in town. Melissa Hastings (Torrey DeVitto) and her father Arthur (John O’Brien) were the least happy about the news and just as Melissa was about to tell her mother Veronica (Lesley Fera) something important the police showed up cutting her short to announce that CeCe Drake (Vanessa Ray) had escaped police custody. What was she about to say? This moment is revisited later when Melissa pleads with her dad to come clean to Veronica but he refuses saying she can never know. On their way to the hospital Ali and Aria have an honest discussion about Ezra with Ali asking if there’s a way for them to get past the lies and be together. Aria shuts her down saying she can’t think about it now and she has to concentrate on him being alive. At the hospital A tried, and failed, to gain access to Ezra as he was being operated on. Meanwhile Hannah, Emily and Spencer kicked off their plan to keep A away from Ezra by paging Ali over the speaker system putting A onto her trail. As soon as Ali heard the announcement she left the hospital and was followed by A to a park. As it seemed Ali was about to come face-to-face with A, the other girls (minus Aria) made themselves known but were taken by surprise when a group of people dressed as A with masks on circled them. As things were getting intense the police turned up and broke the group up with the girls escaping. 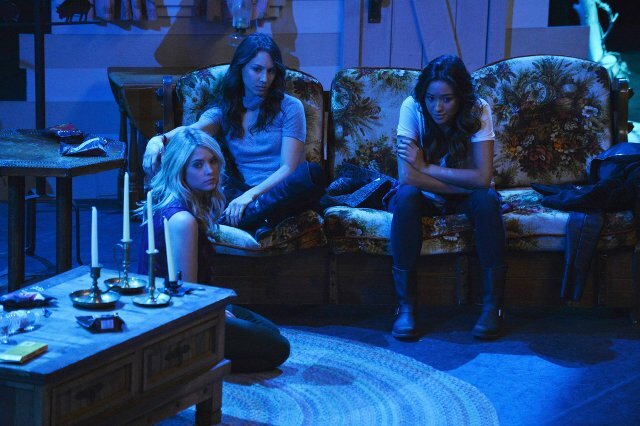 Ali took Emily, Spencer and Hanna to a theatre she had been spending some nights in whilst she was hiding. It turns out the theatre belonged to Ezra’s family and he’d taken her there previously. As the four girls settle down for the night waiting on news from Aria, Ali separates herself off to make some phonecalls which rings alarm bells with the other three. Back at the hospital Shana (Aeriel Miranda) arrives to keep Aria company saying Ali asked her to keep watch. Once Aria falls asleep, Shana wanders off and Aria later finds her in Ezra’s room. When Aria enters the room Ezra wakes up but goes into shock so she calls for help and is taken out of the room. Whilst the girls are sleeping, Ali slips out to meet Noel (Brant Daugherty) and CeCe. She gives CeCe her fake passport to enable her to get out of the country. 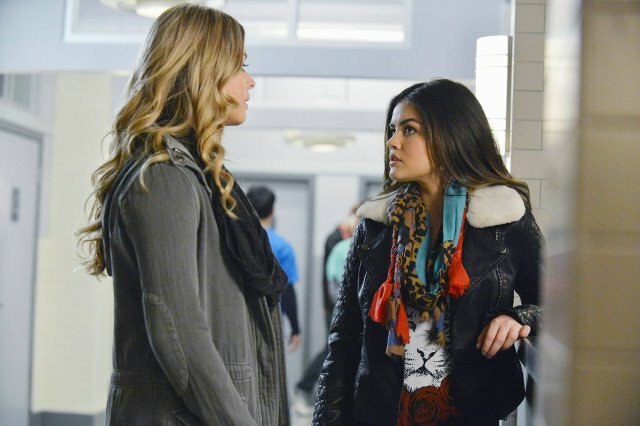 When Ali returns to the theatre she finds Emily awake who demands to know what’s going on. Ali takes her to one side and explains that CeCe has done a lot for her including killing Detective Wilden (Bryce Johnson). Detective Holbrook (Sean Faris) spent much of the episode researching Ali’s case focusing in on Ezra. Figuring the girls are in New York due to Ezra being shot there he tracks down the details for The Fitzgerald Theater and calls the number. Ali picks up thinking it’s Aria calling and Holbrook recognises her voice. When Ali hangs up he asks the NYPD to send officers to the location. Then came the big reveal for the season premiere. Aria returned to Ezra’s side and her whispered the identity of A into her ear. Meanwhile back at the theatre the lights went out and the four girls were confronted by a gun wielding Shana intent on exacting revenge for what happened to Jenna (Tammin Sursok) years earlier. Before she can get gun happy Aria sneaks up behind her with a rifle in her hands that was part of the set and knocks her into the orchestra pit. Shana hits her head and dies. Despite the shock the girls realise that their nightmare could be over (although we know it won’t be!). Someone else who wasn’t happy about the return of Ali was Mona (Janel Parrish). She called together a group of people Ali had bullied over the years including Paige (Lindsey Shaw) and Lucas (Brendan Robinson) and appealed to them to stick together to protect one another. Paige tried to leave the meeting but decided to stay when Melissa turned up. As the episode drew to a close Spencer called the police to report Shana’s death and CeCe left the country as Ali’s alter-ego Vivian Darkbloom. Pretty Little Liars continues Tuesday at 8/7c on ABC Family in the US.